What is diapraxis? What is the Hegelian dialectic process? As best as I can explain, it is a dangerous process which is used over and over again by many false teachers and corrupt pastors to convince undiscerning Christians that there is nothing wrong with what they are teaching them, and that perhaps there can be two differing points of view that can live right alongside each other in harmony. It is a way of teaching that says we can get along fine and accept each other’s seemingly contradictory belief systems. Dean Gotcher explains that the dialectic process means that “truth must be treated as an opinion.” For example, the battle going on now between theistic evolutionists and Biblical creationists is a good example. Many in the Nazarene denomination and other denominations make the argument that we can hold to either belief system and still have harmony within the church. Many of these folks have been victims of diaprax, and they don’t even know it. In this short video excerpt from Dean Gotcher’s seminar on diapraxis, he gives a brief explanation of the term, and also his testimony of how he managed to escape the dangers of worldly thinking and reasoning, and his return to complete trust in the Bible. I encourage you to go the links at the end and watch his full seminar on this important topic. It is probably the primary way that today’s false teachers and corrupt pastors are bringing great harm to the church. Instead of standing completely on the full authority of God’s word, many foolish Christians are being swayed to “get along”, to seek “unity”, and to not cause division, and these diapraxers know exactly what they are doing. I recall from the past five years what may be a classic example of diapraxis. I recall one of them particularly, which is a bit frightening, and it is something that probably happens all the time to many undiscerning Christians, even longtime “mature’ Christians. You see, I believe in what God says, and that there is no other option for me. Some however are easily swayed by the words of man, and are led to compromise their faith in God and what He says. It was my first public presentation on the emerging church, which happened in 2009. I was invited to speak by the pastor at my current Nazarene church, (since retired), and whom I consider to have been very bold and courageous for asking me to come. I spoke to a crowd of about 150 people, including quite a few from various churches in the area. After the presentation, I was approached by several people; some came to compliment me, others had some questions. It was then that an older Christian from my former church came up to me. He was full of encouragement, and expressed his appreciation for my taking a stand against false teaching. I was, needless to say, happy to have his support and hear his encouraging words. But I was shocked and dismayed, when less than six months later, to hear of what seemed to be a turnaround for this longtime respected Christian in the church. At my former church one Sunday, my brother passed out copies of my not so well-received front page article from The Good News Today, which essentially was the same thing I talked about months earlier. As my brother recounted to me later about his experience, he told me how that gentleman, who had acknowledged the truthfulness of what I spoke, now had changed his mind somehow. His very words regarding my article were something like, “that belongs in the garbage.” I believe that over those six months, he had been “diapraxed”. What makes people change their minds like that? This gentleman never once called me to explain why he changed his mind. He may not even be aware that I know what he said that day. Was he concerned for me, that I was now in error, and that what I taught that day was totally wrong? If so, why could he not approach me and correct me as a fellow believer is encouraged to do from the word of God? Did he not care about my spiritual well being enough to try to convince me, with the word of God, where I was wrong? This is just one small example of many. Over the past five years, I have received testimony from many Christians about how their fellow believers seemingly have turned on them, even when they acknowledged that they spoke the truth. Some of these who have turned against them, in spite of the truth, have probably been “diapraxed.” They have been taught that it is better to get along rather than keep your convictions about the word of God. It is a dangerous place to be, because many have remained to this day in that state of mind. and bases his work on the foundational reliability of Scripture. What if a Bible teacher: refuses to answer whether homosexuality is sinful; refuses to say whether homosexuals will not go to heaven; and cannot say for sure who goes to heaven or not, even atheists; and teaches that “following your dreams” is what will make your life happy. What if a Bible teacher: teaches that Jesus was tormented in hell by demons; believes he/she believes they do not sin anymore; and that you cannot be saved unless you believe that Jesus went to hell. Would you accept any of these teachers as legitimate Bible teachers? Would you use their books as good resources, knowing that they teach these things? Are these teachings or beliefs okay with you, or are they demonic? Would you warn your friends about them? If not, why should you not warn your Christian friends about them? Is it wrong to call out these teachers and expose them if they are preaching false doctrines? 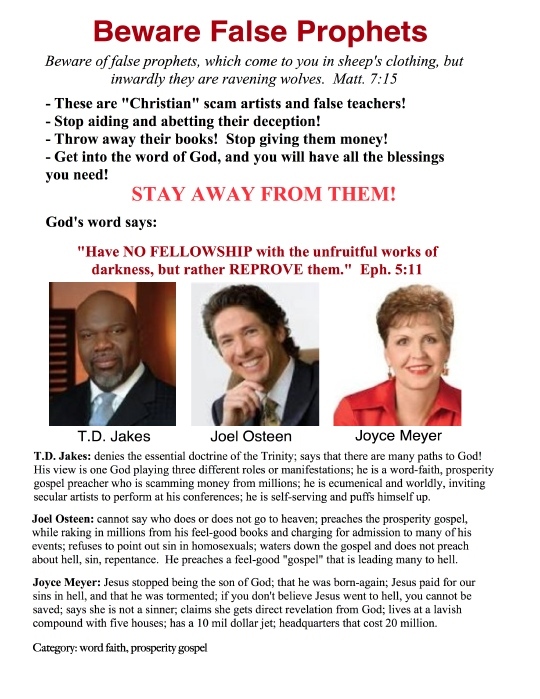 Here is the summary of three false teachers: Joel Osteen, TD Jakes, and Joyce Meyer. All three also share the same kind of prosperity gospel or word-faith teachings that are heretical as well. ​I will post additional​ updates ​with three more for you in a few weeks.